Recently, Amazon released their Kindle application for the iPhone. Since I don’t have a Kindle (but I want one!) I figured this would be the next best thing. They have this technology in the app called WhisperSync which sync’s up the page you are reading, so if you do have a Kindle, you can switch between that and the iPhone app and pick right up where you left off. I heard Mr. Keen on an NPR program talking about his book, and it piqued my interest. First off, let me say that reading the book on the Kindle iPhone app rocks. I read this book in like 3 days just reading it here and there when I had some free time, just pulled up the iPhone and started reading, very slick. Now, about the book. He goes into detail about how Wikipedia, Illegal movie and music downloads, blogs, YouTube, Google, User Generated Content, remixes, mashups, etc, and everything Web 2.0 (and even Web 1.0 – in my opinion sometimes he just blur’s the distinction) is killing our minds, and media, and jobs, and culture, and everything else. I got the feeling while reading this, imagining an author back around the time cars started to get popular, but horses were still on the roads, where the author is complaining about autos and transportation using them, arguing we need to save horses as the method for transport. If newspapers, local tv news, magazine, artists, etc don’t want to keep up with changing technology, then in my eyes they almost deserve to fail. He refers to Beethoven and Mozart and how they would never use the methods today to distribute their works, etc. It seems that there is this same arguement over and over. I can just see/hear it: “Sheet Music is killing the ability to play by ear!”.. “Radio is killing Sheet Music!”.. “Vinyl Albums are Killing Radio”.. “8 Tracks are killing Vinyl” (ok, I am joking on that one).. “Cassettes and CD’s will kill Vinyl”… “Mp3’s are going to kill CD’s!”.. Wait up. The part I didn’t add on all those quotes was this . ” and the artists suffer”, yet the artists always continue to survive. Its the fat cats, the middlemen who end up losing out. The publishers and then go betweens that need to change their models and they just don’t adapt to change fast enough, or do they want to change. It seems that they just want it how it is right now, and everything will be fine, and I guess I disagree. Wikipedia, YouTube, all the mashups – they release creativity. What you as a user of these services need to realize is that you need to take everything at face value. You shouldn’t take Wikipedia as gospel, it is up to you to know that. Most people don’t do that though, and thats the problem. Instead of blaming the services and the content, how about we look at ourselves? Ok, I could keep ranting on every part of this book in the same manner, but I will stop. 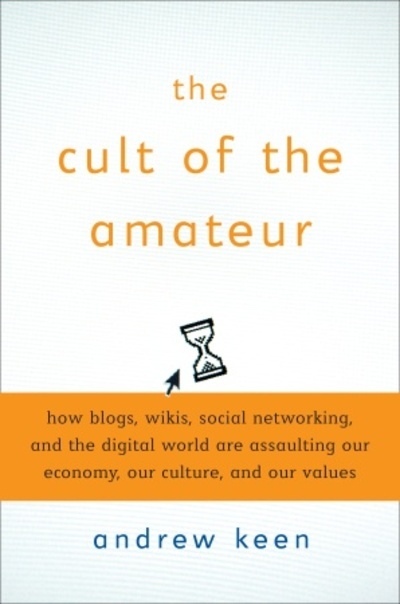 It is a good read, gives another perspective of the “Web 2.0 Revolution” (as I roll my eyes – it isn’t a revolution at all, its an evolution – things will always change). In the end ,it just seems as the old media and the old ways of doing things are trying to cling on to anything they can to try to make it stay the way it was, but that just isn’t going to happen. With everything, you CHOOSE to be a part of it or not. You don’t need to use Google, or the internet or anything, and you will be just fine, but if you do choose, then you play by the rules (or non-rules) of the net, plain and simple. Previous Post Twitter or Yammer?